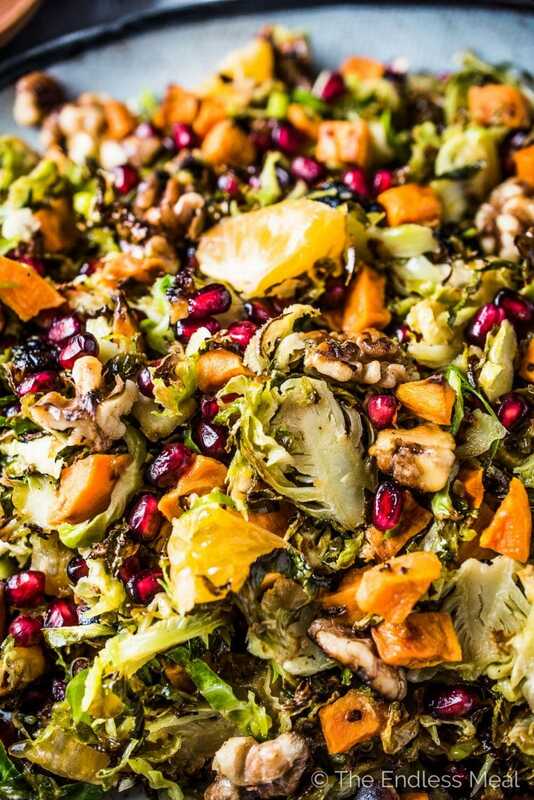 Roasted Shaved Brussels Sprout Salad has all of your favorite autumn flavors. The Brussels are first roasted and then tossed in an orange lemon vinaigrette. You'll find sweet potatoes, toasted walnuts, mandarin oranges, and pomegranate all hiding in this healthy and delicious side dish. Today is about all the cold weather eats we love. They've come together (at last!) 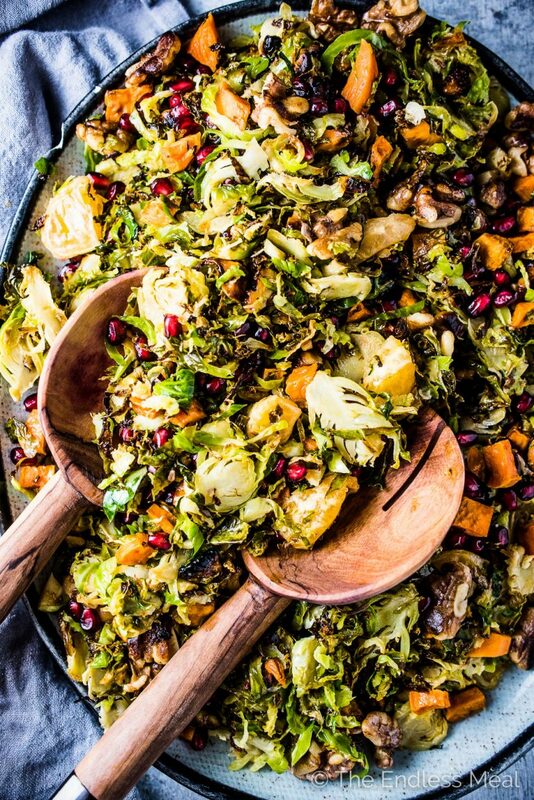 in one delicious bowl that I'm calling a Late Autumn Shaved Brussels Sprout Salad. Late autumn as in right now and for the rest of this chilly season. We've got a whole pile of shaved Brussels that have been roasted to deliciousness because (IMO) roasting Brussels is the only way to go. Sidebar → Do you remember when you were a kid at Thanksgiving dinner and your (mom/ aunty/ grandma) made you take a scoop of boiled to death Brussels and you politely spent the rest of dinner trying to choke them back? For years, I thought I didn't like those baby cabbages. I swear my childhood Brussels nightmares wouldn't have happened had someone thought of popping them into the oven rather than in a pot of boiling water. Even my 1 1/2-year-old daughter fights me for salty roasted Brussels. 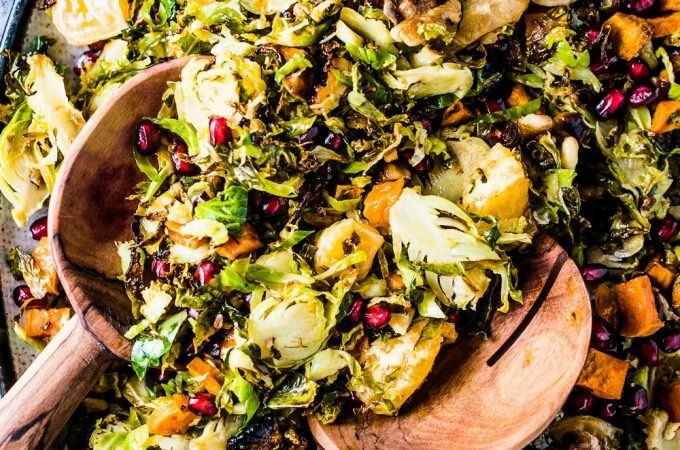 In this salad, we're using shaved Brussels, which are all kinds of awesome. Once they're roasted, they packed full of delicious flavor and have lots of little crispy bits on them. Serious goodness here. A few times (in the distant past) I've made a shaved Brussels sprout salad. The first I shared here was this Shredded Brussels Sprouts Salad with Bacon and Apricots. It was a year before the next one (a Roasted Brussels Sprouts Caesar Salad) came around. That was almost 2 years ago to the day. So why the two year shaved Brussels sprouts salad hiatus? Here's the truth: shaving Brussels is a bit of a pain. You either have to pull out your mandoline and pray to all the gods that one of those little green balls doesn't slip and you don't lose the end of your fingers. Or you have to slice each one in half then spend a half hour thinly slicing them. Not impossible, but not super fun. Things are a little different now! Times have changed and now Culinary Cuts does all the work for you. (Taking a deep bow of appreciation here.) They thinly shave those little Brussels so you don't have to. Thank you! Rather than doing all the tedious (and bordering on dangerous) work, all you have to do is open a bag. Grab both sides, pull the plastic seam apart, pour the Brussels onto a baking sheet. I'm all for spending time in the kitchen, but let's be honest, if someone is offering to chop my veggies for me, I'll take them up on the offer. Thank you, Culinary Cuts for offering to be my sous chef! 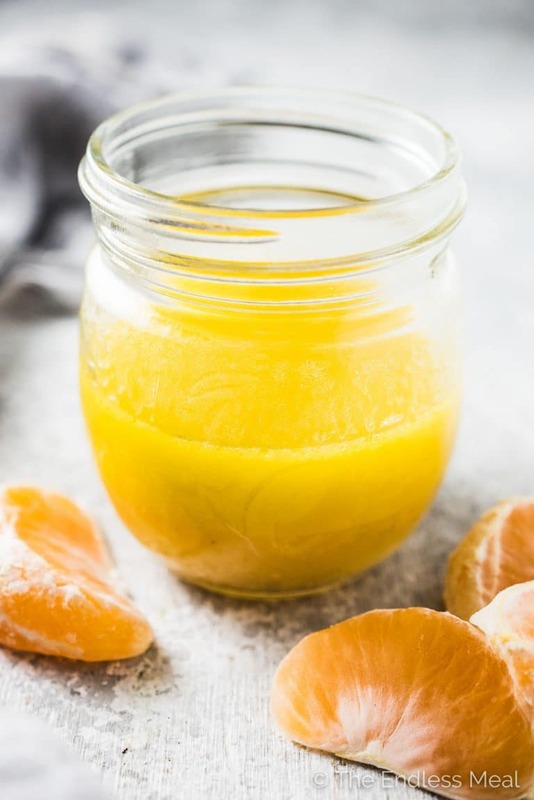 Have you ever used mandarin oranges to make salad dressing? Ya, me neither until now. Since this salad is all things autumn and winter and mandarin oranges fall firmly into that category, I knew they were the ones. I often like to add some maple syrup or honey to salad dressings that are destined for cold weather salads. (I'm looking at you, kale salad!) Heartier greens (as well as Brussels) can be a touch bitter. Adding sweetness to the dressing balances this out. Mandarin oranges are super sweet. Like I need to tell you that. That's why we eat them by the fist full while they're in season. But since they have so much natural sweetness, there's no need to add any extra to the dressing. ♡ Sweet potatoes. Roasted to bite-sized perfection. Sweet. Delicious. Happy. ♡ Walnuts. Popped into the oven until toasted and full of flavor. ♡ Mandarin oranges. We've already been over their sweet deliciousness. They have all the love all season long. 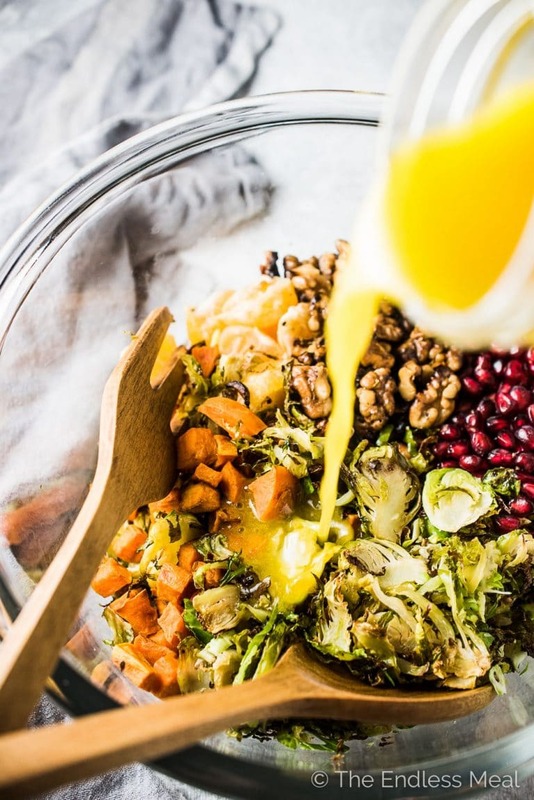 This delicious Shaved Brussels Sprout Salad has all of your favorite autumn flavors. The Brussels are first roasted and then tossed in an orange lemon vinaigrette. You'll find sweet potatoes, toasted walnuts, mandarin oranges, and pomegranate all hiding in this healthy and delicious side dish. It would be perfect on your Thanksgiving or Christmas table and delicious all winter long. 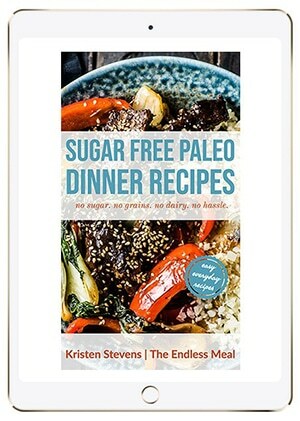 Whole30 + paleo + easily made vegan. 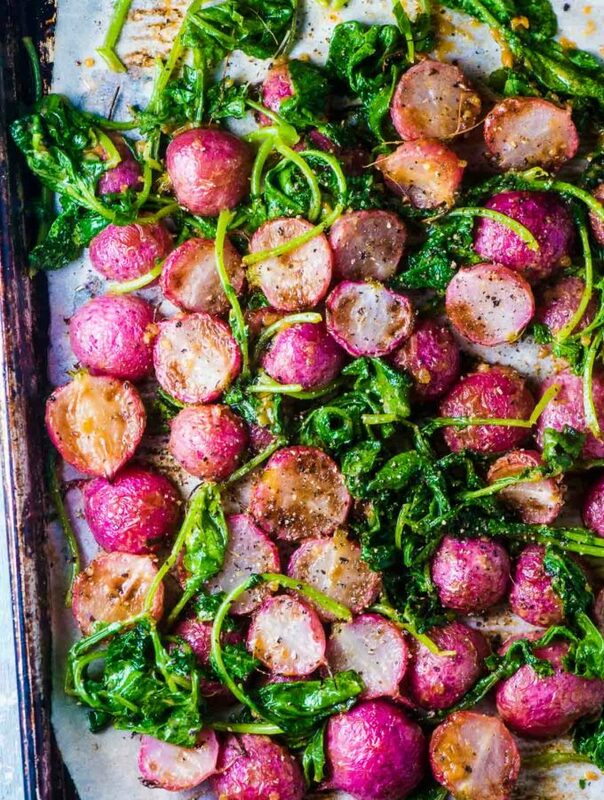 Place all but 1 cup of the shaved Brussels on one baking sheet and the sweet potatoes on another. 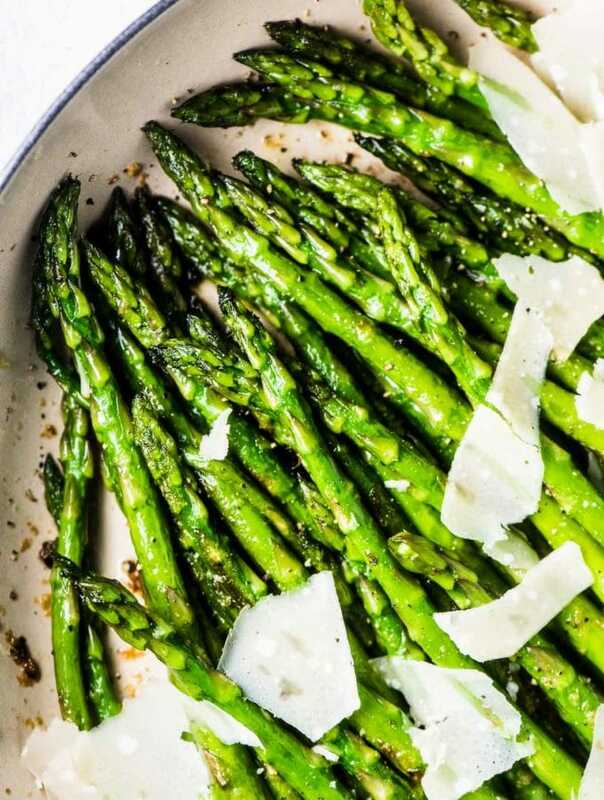 Toss both with oil then roast in your oven for 30-35 minutes, tossing halfway through. Heat the butter, ghee, or olive oil in a small frying pan over medium-high heat. Add the walnuts and let them toast until fragrant, about 2-3 minutes, shaking the pan often. Combine all the dressing ingredients in a jar and shake. 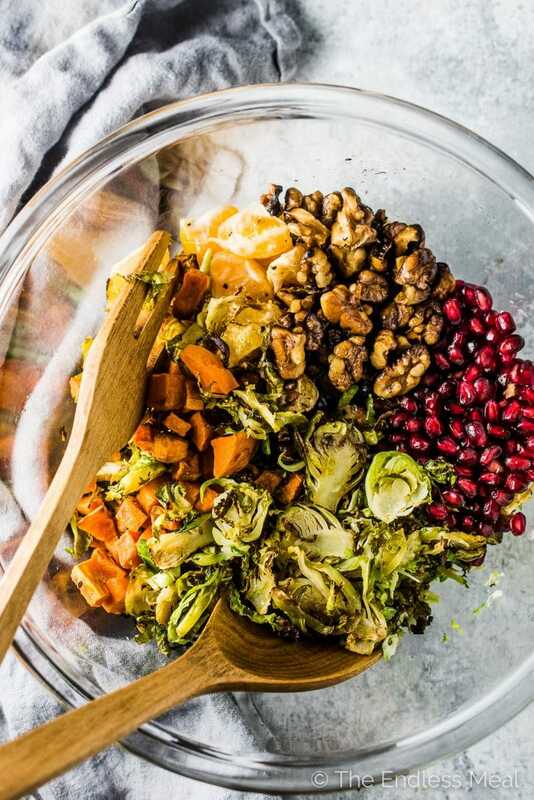 In a large salad bowl, add the 1 cup of raw and the roasted Brussels, the sweet potatoes, walnuts, orange segments, and the pomegranate arils. Toss with the dressing and serve. Is this supposed to be served warm? Do you know how it is cold? I’ve had it both warm and cold and it is delicious both ways! I couldn’t wait until autumn to make this and I’m so happy I didn’t wait. It was amazing. All the flavors were perfect! 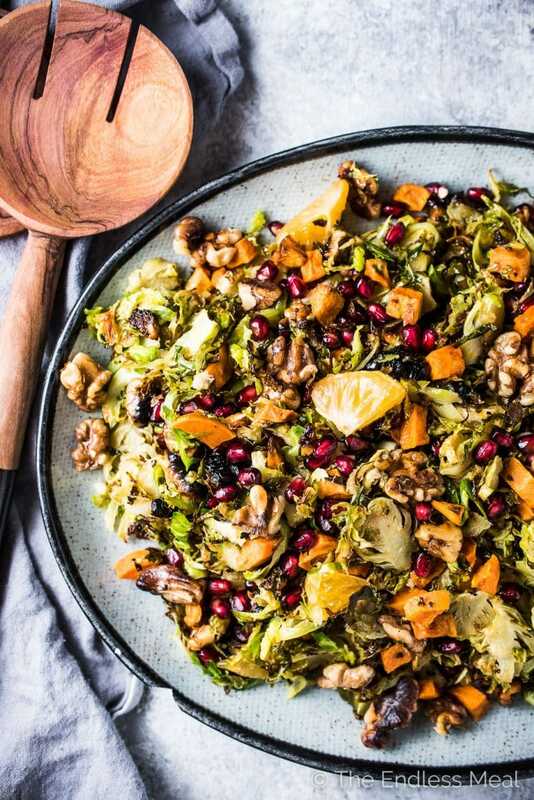 Served this with your Cranberry Orange Chicken recipe for Christmas dinner and it was a huge hit– even with non-Brussels sprouts lovers! I left out the sweet potato this time (as we were having butternut squash in another dish), and I subbed toasted pecans for the walnuts but everything else was just as written. Great vinaigrette, great combination of flavors, and a beautiful presentation to boot. Thanks so much, Kristen! That makes me so happy to hear! Two of my recipes on one table – that is such an honor! !